Investors weren't happy with the company's latest rebound plan. 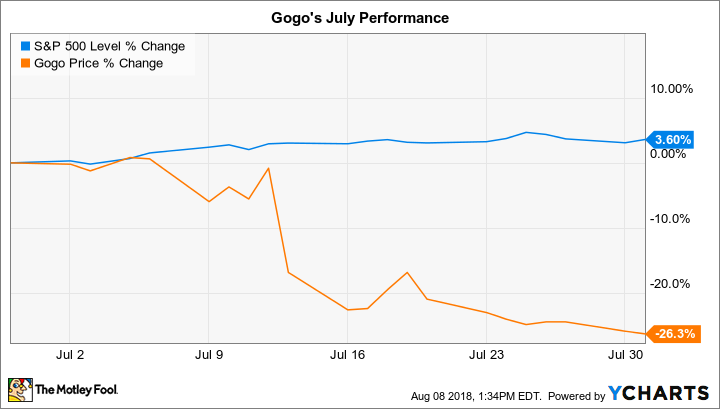 Inflight internet service provider Gogo (NASDAQ:GOGO) trailed the market last month by shedding 26% compared to a 3.6% increase in the S&P 500, according to data provided by S&P Global Market Intelligence. The slump added to a brutal period for shareholders, who've seen their investment fall by over 60% since the start of 2018. July's decline was powered by investor reaction to the company's worsening financial picture and modest growth outlook. Executives said on July 12 that they're planning to slash costs in hopes of improving profitability. These cuts will include lower equipment subsidies to airline clients, which could impact its growth rate. The company also said it is "reviewing multiple options" to address a significant debt liability that is due in March 2019. These options include potentially breaking the company into two separate units. In fiscal second-quarter results issued in early August, executives affirmed expectations to reach sales of between $865 million and $935 million this year. Gogo hopes to achieve adjusted earnings of over $200 million by 2020 while also cracking into positive free cash flow. Yet net losses will be significant this year as the company tries to balance aggressive cost cuts with its need to invest in improving the quality of its service.